Cala Tuent is located in the north-western part of Mallorca, where the beaches are a bit further apart. The town Sa Calobra, which more people may be acquainted with and home of the attraction Torrent de Pareis, is located only a few kilometres away. Cala Tuent is located in the most beautiful natural surroundings with a view of the highest mountain in Mallorca, Puig Major, with an altitude of 1,445 metres. 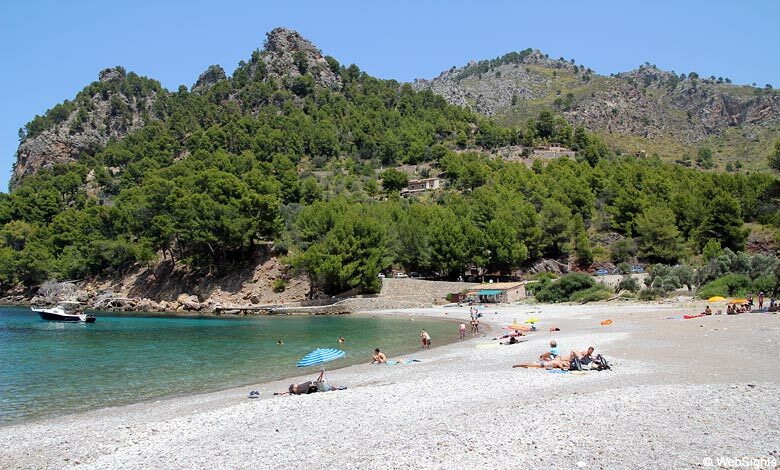 The beach is 100 metres long and situated inside a lovely bay surrounded by the wooded Tramuntana mountains. The sand is mixed with gravel and pebbles, also in the clean and completely clear water, which makes bathing shoes a wise choice. The bay is perfect for a long swim. There are no facilities at the beach, not even toilets. 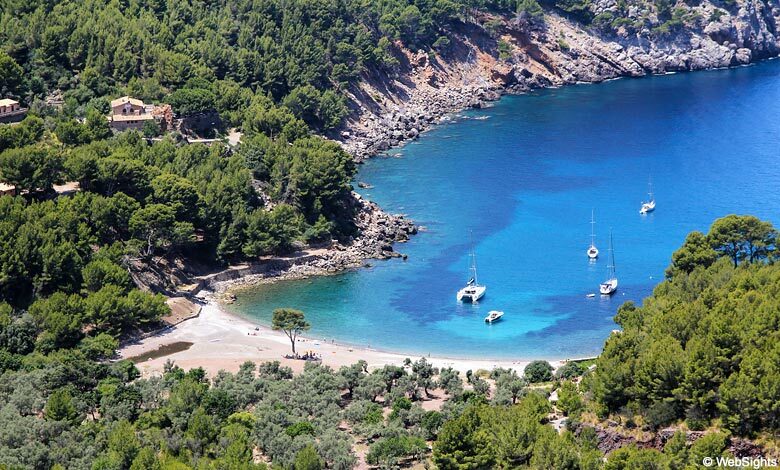 However, Cala Tuent is one of the most peaceful beaches in Mallorca, probably because of the long drive to the beach. There are plenty of signs directing the way to Cala Tuent. Go in the direction of Sa Calobra and the signs will guide you the rest of the way. There is a big free parking space at the beach. 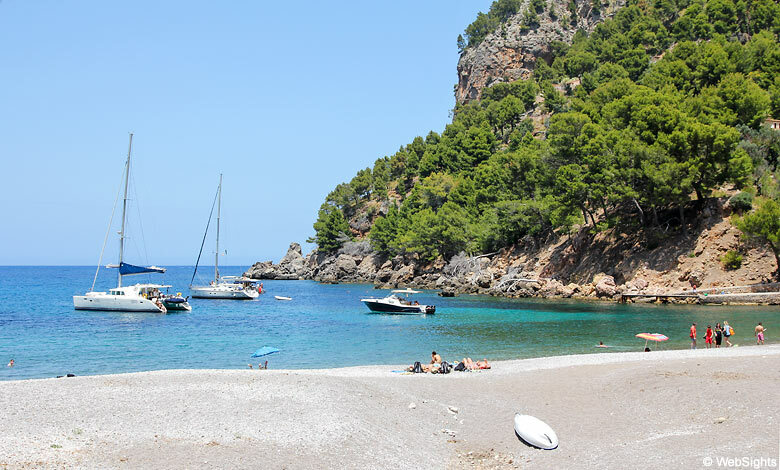 It is also possible to reach the beach by boat from Port de Soller about an hour away. The beach has plenty of room to play, however, the combination of sand, gravel and pebbles does not provide the best conditions for children. Bathing shoes are recommended. None, however, the beautiful bay has the perfect diving and snorkelling conditions and there are rarely any waves. There are no restaurants at the beach itself, but the restaurant Es Vergeret is fairly close to the beach. From the restaurant terrace, you can enjoy the most spectacular view of the bay. The nearest holiday resort is Port de Soller, which is located 8 km southwest of Cala Tuent. However, by car the distance is 41 km and the drive takes about an hour through the mountain landscape. 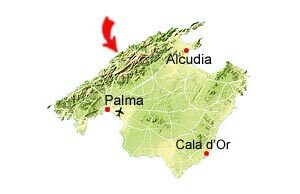 From the two larger holiday resorts Port d’Alcudia and Puerto Pollensa, the drive is only a little longer. A perfect excursion with your rental car would be to visit Sa Calobra in the morning, before all the big tourist coaches arrive, and then enjoy the rest of the day at Cala Tuent. The beach is beautifully situated inside a bay surrounded by mountains. In the bottom left corner of the map, you can see the restaurant Es Vergeret. It is located a bit up the mountain and it is possible to go there by car.